There’s a whole score of wedding movies that lend perspective to the various players in any wedding. The Wedding Planner, My Best Friend’s Wedding, Bridesmaids, and The Wedding Singer all tell you exactly who they are representing in their titles. My personal favorite wedding movie is the timeless classic Father of the Bride. Besides the hilarious exchanges between Steve Martin and Martin Short, the movie offers a poignant look at the often overlooked father of the bride. I have it on good authority that dads with daughters cannot make it through this movie without shedding a tear. It’s scientific fact. We thought it would be fun to take a closer look at the father of the bride and figure out how to make him feel special. He really only gets two moments of attention during the whole day. There’s the dramatically charged question, “Who gives this woman to be married today?” and then there’s the sentimental father-daughter dance. Of course, the day is not about dad, but it’s a pretty big deal for him. Don’t believe me? Just watch Father of the Bride and you’ll get it. So brides, we’ve got five thoughtful gifts that knock dad’s socks off. Speaking of socks, this personalized pair is both practical and sweet. I love that it plays up on that major moment for him–walking his girl down the aisle. He can wear them on your big day and save them for special occasions after. 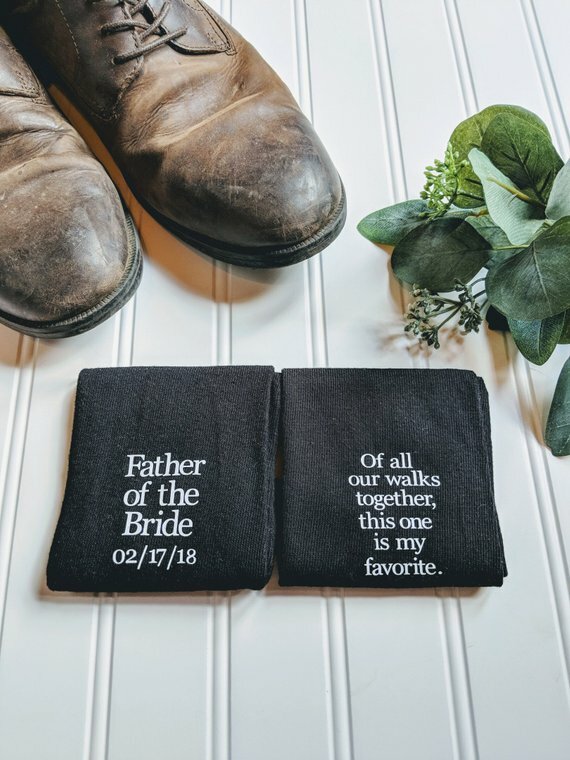 There are a number of stores that sell this footwear, but we prefer It’s Your Turn Socks because they even have an option to gift to the father of the groom. You’re welcome, new daughter in law. If your dad is prone to waterworks, you might as well make sure he’s prepared. 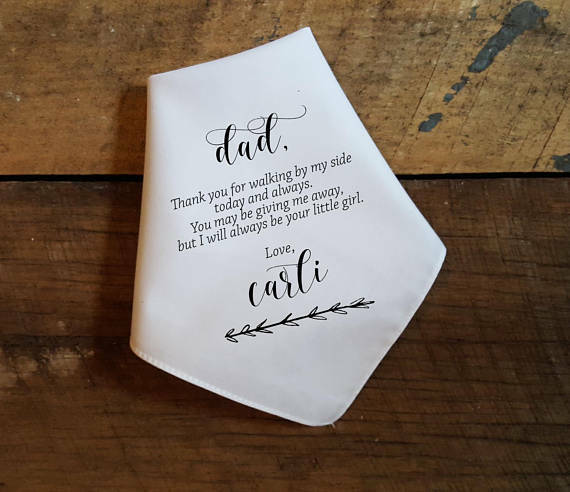 A customized handkerchief is a perfectly thoughtful way to show him you care. Bonus tip: get a matching one for mom, too! 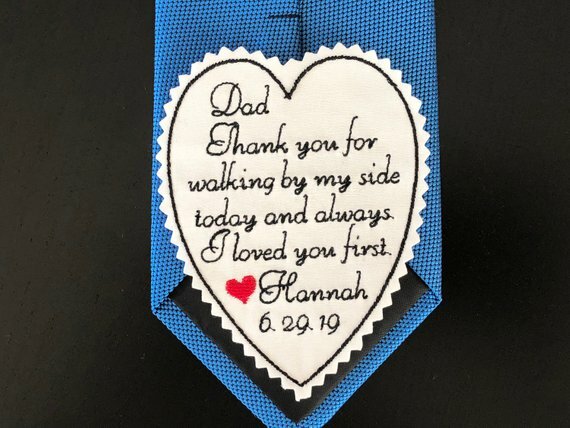 Another sweet accessory you could gift your dad is a patch for his tie. Like the socks, no one but you two will know it’s there, but it is a very sentimental gesture. 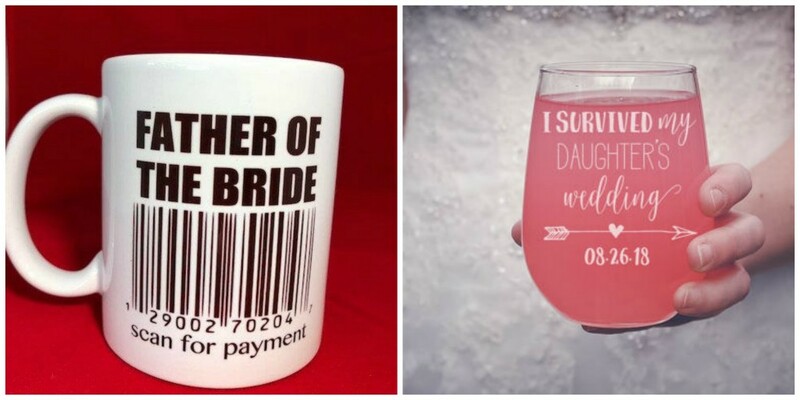 You can also gift one to the father of the groom. Do you have a special song to dance to with your dad? Everyone knows the father-daughter dance is one of the sweetest parts of the reception. Whether you choreograph an elaborate dance that ends up going viral (wink) or choose to slow dance with dad, the song lyrics from your dance will always be special to him. 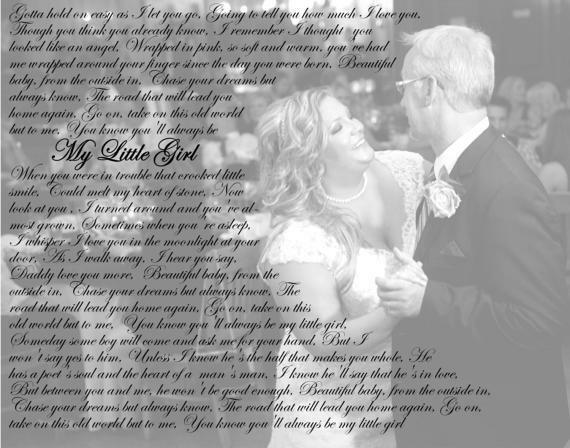 Wait for your photographer to give back your photos, and then you can make a personalized print with your dance lyrics. This is one of those gifts that will be enjoyed forever. 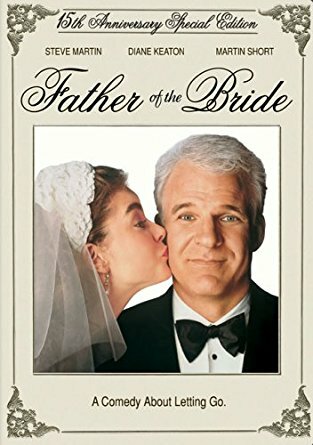 If you watch Father of the Bride, you’ll notice that the two biggest conflicts for George Banks (Steve Martin) are losing his little girl and paying for the wedding. Much of the hilarity arises from his inability to accept that weddings cost a fortune. 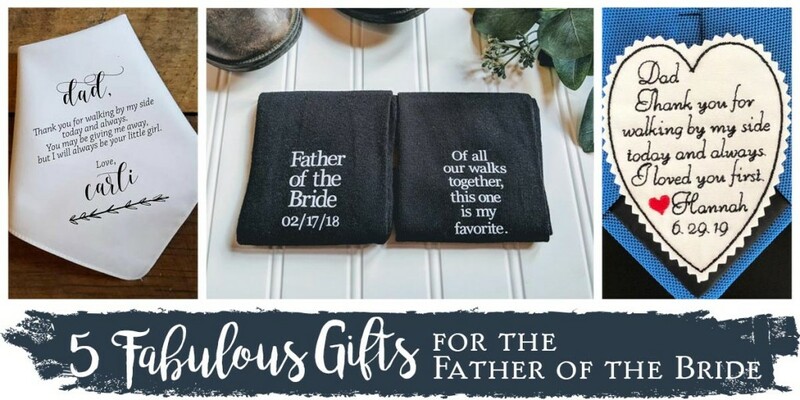 This theme is nothing new in the world of wedding planning, and you can have some fun with it when it comes to your father of the bride gift. A word of caution would be to only play up this joke if your dad has a solid sense of humor. You don’t have to spend much to go the extra mile with your gift for father of the bride. What really matters is that you show him your love and appreciation. Whether it be a pair of socks, a cheesy mug, or a handwritten letter just make sure he understands how you value him. We hope these ideas help you as you plan your wedding. As always, be sure to share with us on Facebook and Instagram and tag #superiorcelebrations. ‹ The Best Fourth of July. Ever.